Successfully Added Android Mini Projector GP1SUP - DLP Technology, Quad-Core CPU, 8GB Memory, 1080p Support, 2500mAh Battery, WiFi to your Shopping Cart. The GP1SUP mini projector is capable of turning any dark room into your own private cinema. 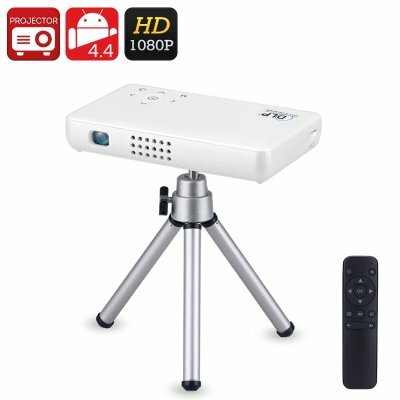 Featuring DLP technology, this mini projector provides you with smooth 480p images. Added to that it comes with a wide color gamut and excellent grayscale. Thanks to this, you can be guaranteed that you’ll be treated to a cinematic experience every time you turn it on. With 8GB of internal memory, this DLP projector comes with plenty of storage for you to keep all your media at hand. Whether you’re at home or work, from now on you’ll always be able to watch films, give presentations, and more. Featuring an Android operating system, this portable projector is so much more than a regular DLP mini projector. This Android projector brings along hours’ worth of fun and entertainment. It runs on a Quad-Core CPU and has 1GB of RAM. With this hardware, it can handle decent media files without dropping a frame. Its Mali-450 graphics unit additionally brings along vivid color and high detail for you to enjoy. Supporting 1080p, this DLP projector is capable of playing the vast majority of films out there. This Android mini projector comes with a built-in 2500mAh battery that brings along plenty of juice. WiFi support and other software features will further increase your overall experience. The projector has an adjustable image size up to 100 Inches and a projection distance ranging up to 3 meters. Thanks to this, the projector is capable of producing great visuals no matter where you’re at.